What a fabulous Sunday it was yesterday! Fideuà for lunch at Ramon and Asumpta's house... finding the full page article that Alexandre Roa Casellas wrote about me in the Sunday edition of Diario de Girona... and capping the night off with watching Con Otro Aire shoot scenes for their upcoming music video on Nacho and Lesli's terrace facing Tossa de Mar's spectacular muralla. Con Otro Aire a band based in Blanes and educated in Sevilla under the tutelage of Paco de Lucia --researching the web, I think that they attended the Fundación Flamenco Cristiana Heeren. They usually come to Tossa to play a few nights at a nightclub just around the corner of our house/studio, Mar-i-Cel. Alexandre did a great job with the piece. It's amazing how he summarized our conversation in my studio taken so long ago -without notes or any other kind of recording. 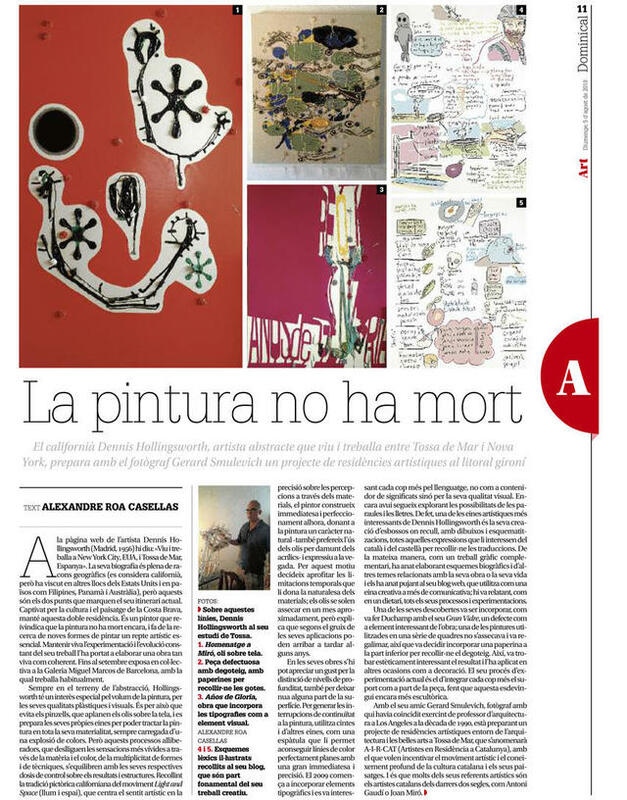 Very nice, too that he published not only images of my paintings but also that of a few pages from my Catalan/English/Castellano dictionary. An english translation is under the fold. 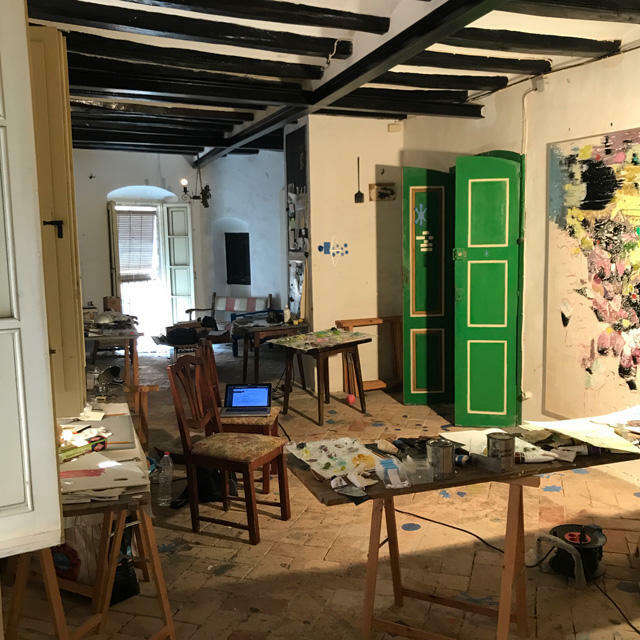 At the webpage of the artist Dennis Hollingsworth (Madrid, 1956) is indicated: Lives and works in New York City, USA, and Tossa de Mar, Spain. His biography is full of geographical corners, but these are the two points that mark his today's itinerary. Captivated by the Costa Brava's culture and landscape, he keeps this double residency. 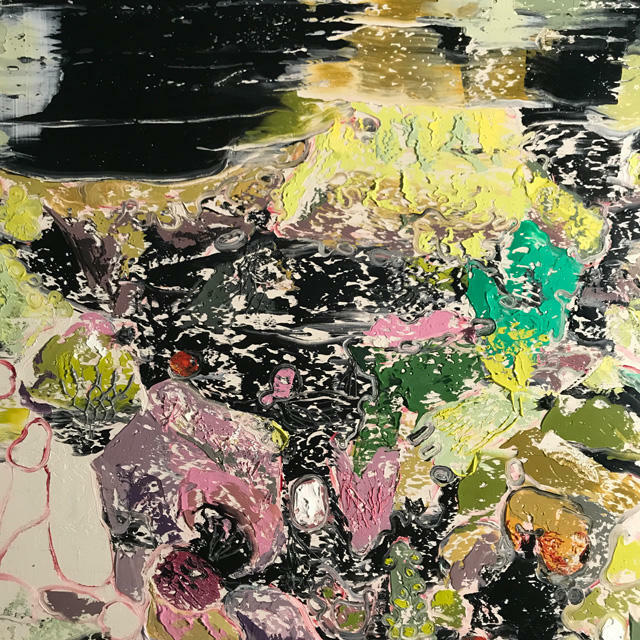 We speak of a painter who vindicates that painting has not yet died and has the research of new ways of painting as an essential artistic challenge. To keep alive experimentation and constant evolution of his work has brought him to elaborate a work alive and coherent as well. Always in the ground of abstraction, Hollingsworth has a special interest for the painting's volume and it's visual and plastic qualities. 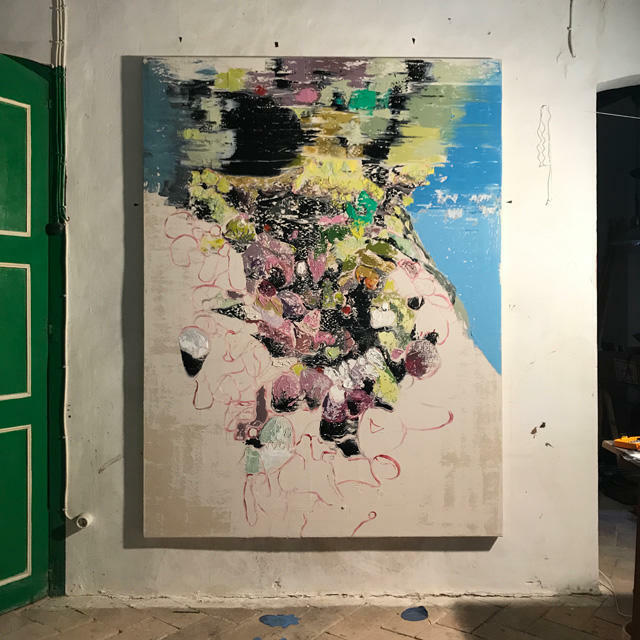 That's why he avoids the use of brushes, which flatten the oils on the canvas, and prepares his own tools to treat the painting in it's whole materiality, always loaded of a colour explosion. But these freeing processes, that unleash the most vivid sensations through mater and colour, through multiplicity of forms and techniques, are balanced with their respective doses of control over structures and results. Picking up the Californian painting tradition of Light and Space movement, which focuses the artistic sense in the precision over perceptions through materials, the painter builds immediacy and perfecting at the same time, giving the painting a natural character - he also prefers to use the oils over artificial paints - and expressive too. That's the reason why he decides using the time limitations that the nature of materials give him; oils use to dry in a month approximately, but he explains that depending on the thickness of the applications they can even last some years. At his work one can appreciate a taste for the distinction of depth levels, also for letting some parts of the surface naked. 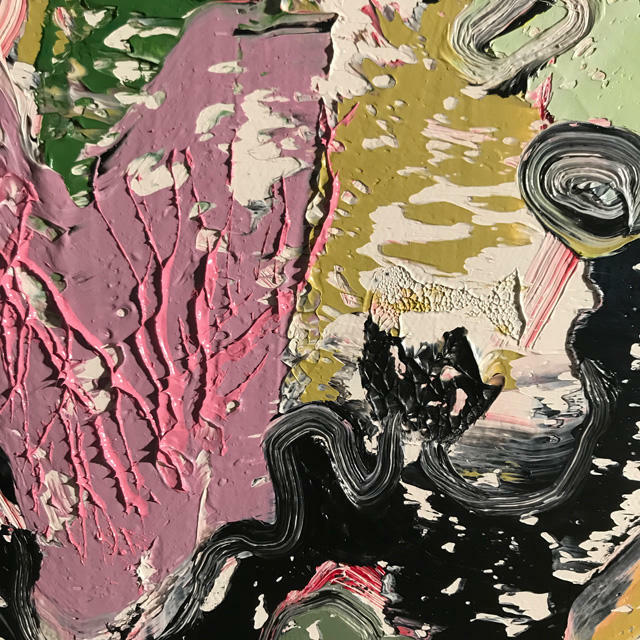 To generate the interruptions of continuity in painting, he uses tapes and other tools, such as a spatula that allows him get perfectly plane colour lines with great immediacy and precision. In 2009 he begins to incorporate letter elements and gets interested by language, not as a meaning container but for it's visual quality. Yet now he continues exploring the possibilities of words and letters. In fact, we must remark that one of the most interesting artistic tools of Dennis Hollingsworth is his creation of sketches where he compiles, with drawings and schemes, all those expressions from Catalan and Spanish he is interested about to include the translations. In the same way, as a complementary graphic work, he has been elaborating biographic scenes and other elements related to his work or his life and he has been uploading them to his weblog, which he uses as a creative tool more than a communicative one; there he tells, as in a diary, all his processes and experimentations. One of his latest discoverings was to incorporate, as Duchamp did with his Great Glass, a defect as an interesting element for the work; one of the paints used in a series of paintings wouldn't dry and began to drip, so he decided to add a paper below to pick up the dripping. This way, he found the result aesthetically interesting and applied it in other works as a decoration. His current experimentation process is to integrate the support as a part of the piece, making it become even more sculptural. Together with his friend Gerard Smulevich, a photographer with whom he taught architecture in Los Angeles in the 90s, he is preparing a project of artistic residencies about architecture and fine arts in Tossa de Mar, that will be named A-I-R-CAT (Artists in Residency in Catalunya), with what they want to motivate the artistic movement and the deep knowledge of the Catalan culture and it's landscapes. See, some of his artistic referents are Catalan artists from the latest two centuries, such as Antoni Gaudí or Joan Miró.